Ok, so where has the summer gone? Well, it may be fall, but that doesn’t mean dropping things to be done to prepare for our upcoming year! Art here, back again to fizzle your decompressing minds with tidbits of Apogaean news. Sunday, Sept 16th was a pivotal Board Meeting as new officers were elected, and there were several items on the agenda. 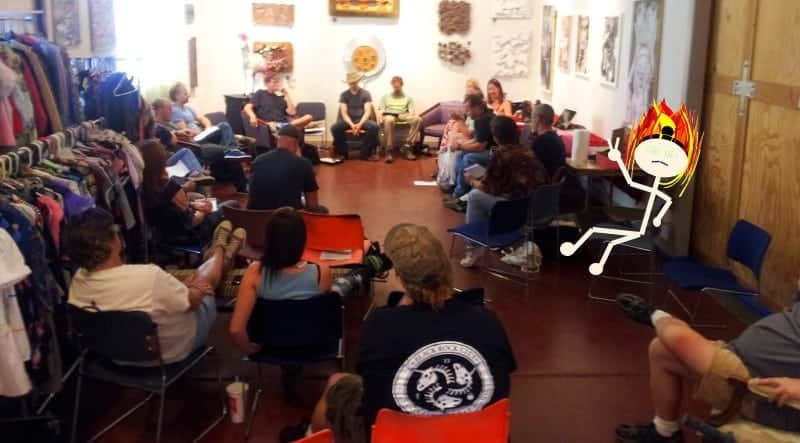 In attendance were all four out-going officers (Cano, Guy, Shutterbug, Robert), nine board members, one Burning Man Regional Rep (Bobalicious) and nine community members. Uncle Dave would have liked to see more hype about the board member elections, to have the Board rally more community members to step up to the plate and participate. There was discussion of moving the election dates sooner so that it doesn’t conflict with Burning Man prep. As of yet nothing has been decided – expect this topic to get discussed at the fall board retreat. Bobalicious asked whether we are donating to the I Love You Guys Foundation. The board unanimously voted to donate $1000 to ILYGF and the Finance Committee will decide from where funding will be appropriated. Steve Merager was the single candidate for Treasurer, and Matt “Duney Dan” Clinton for Secretary. Matt Stringer and Kingpin vied for President, and April “Gliteratti” Menegazzo and John Collins for Vice President. Each candidate for President and Vice President posed persuasive pitches, and answered several tough questions put to them. Drum roll please (ok, so I already announced it online but I must, for the record, say it again)…Kingpin was voted our new President and April our Vice President. Steve will be the Treasurer and Duney Dan our Secretary. Welcome to all the new officers! Kudos for the great job and commitment of the out-going officers! The Board unanimously voted in the new reimbursement policy outlined by Steve. The policy will be posted in the future for your reference. Continuing a conversation from last month’s board meeting about the community’s desire for a temple, the board made a unanimous decision to burn Somer’s Blossom effigy in 2013 (Fingers Crossed for NO burn bans!) and use some portion of the saved funds to hold a contest for the building of a Temple. Flaming Art is wondering what this will mean for future temples at Apogaea. It’ll be great to see the product of your creative juices congealing in your squishy brains for that contest!! Eric will be discussing the 2013 dates with our favorite Bailey land owner. Two dates in June are being proposed. I’ll keep you in the loop with updates as I know we all will be excited to know the dates for 2013! Are you wondering about that ticket design contest? First we have to pick a theme! Deadline for the theme contest is September 30 at midnight. Board meetings will now be held the third Sunday of each month, still alternating between Boulder and Denver. The next meeting will be on October 21, 2012 at the Magic Mansion in Boulder. Community members are encouraged to attend! And as usual, we will desperately attempt to post the agenda more than a few minutes in advance of the actual meeting. Wish us luck!